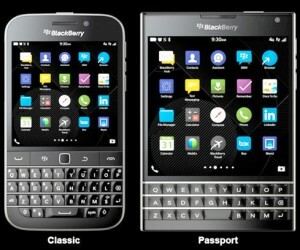 In the past 6 months, BlackBerry has released 2 new business smartphones. However, there has not been any affordable way for U.S. consumers to get their hands on one—until now. The BlackBerry Classic and the BlackBerry Passport have arrived on the AT&T network as of Friday, February 20th. The tech industry giant is the first primary U.S. smartphone company to offer either BlackBerry smartphone for a promotional price whenever a customer signs up for a 2-year contract agreement. The Passport is being offered for $200 on contract and the Classic is being offered at $50. The new AT&T BlackBerry smartphones are the only up-to-date smartphones on the AT&T network that feature physical QWERTY keyboards. For many, typing on a physical keyboard might not be as speedy as using a touchscreen device; however, it can be a good way for business consumers to avoid making typographical errors in their text and/or email replies. Both phones also include BlackBerry security features such as built-in messaging and email encryption. The new BlackBerry Passport features a unique square display designed to give its users more horizontal screen space than most other smartphones. This can be an ideal feature for those who enjoy performing tasks that are screen-sensitive such as the examination of larger documents or spreadsheet editing. The combination of the wider display and the physical keyboard make the Passport a good smartphone option for business users. The Blackberry Classic is designed more like the old BlackBerry Bold 9900. It has a smaller 3.5-inch display and a physical keyboard. It offers many of the same features as the Passport, but with the smaller screen size.